Romania (Romanian: România; dated: Rumania, Roumania) is a country in southeastern Europe. 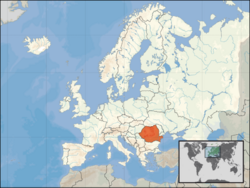 It is bordered by Ukraine and Moldova in the northeast, Hungary and Serbia in the west and Bulgaria to the south. Romania also has a small sea coast on the Black Sea. Its capital city is Bucharest. This page was last modified on 10 August 2010, at 18:19.